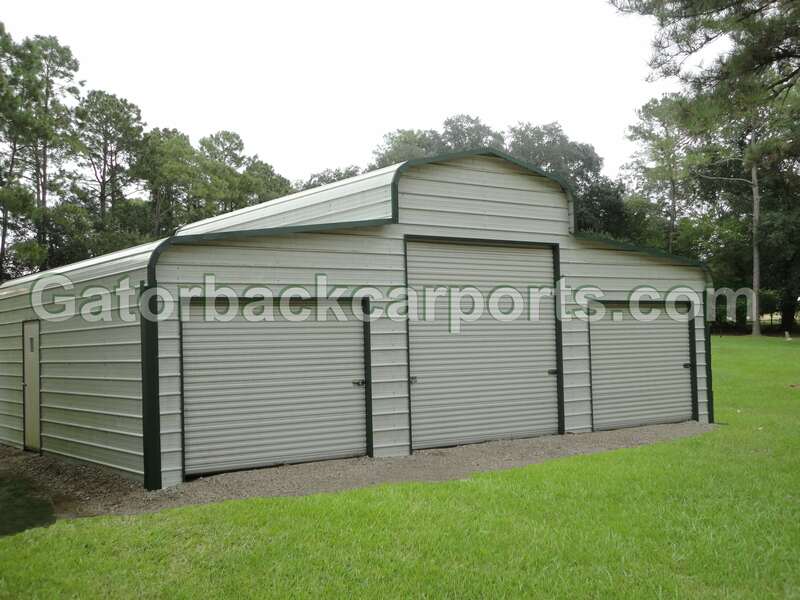 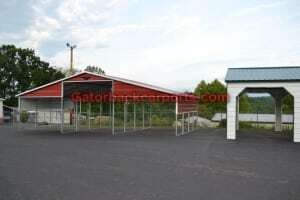 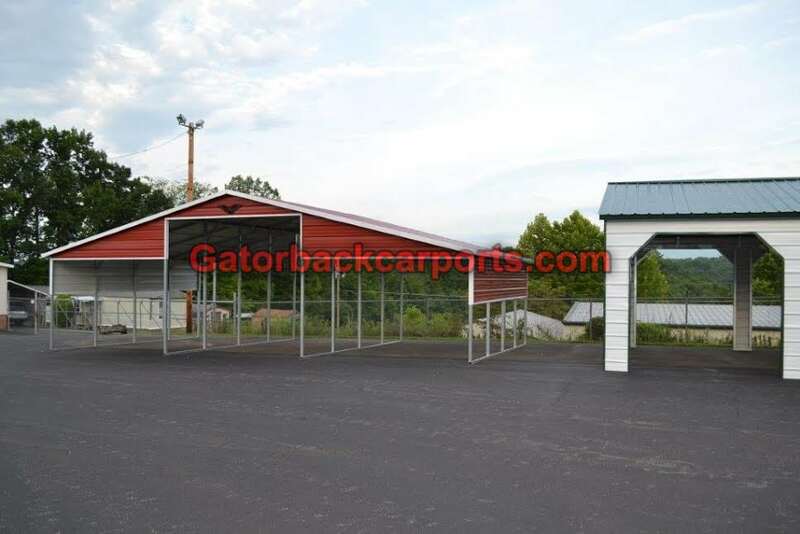 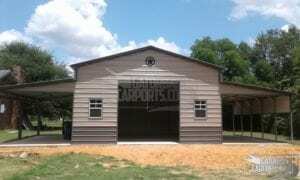 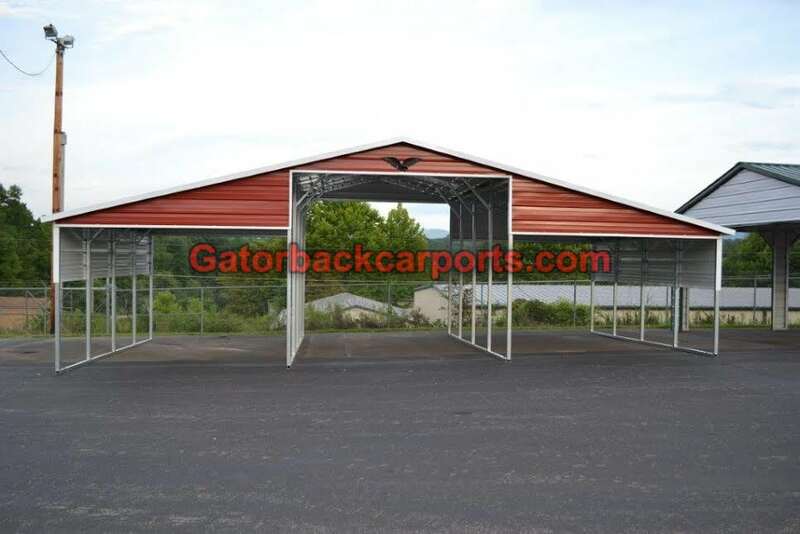 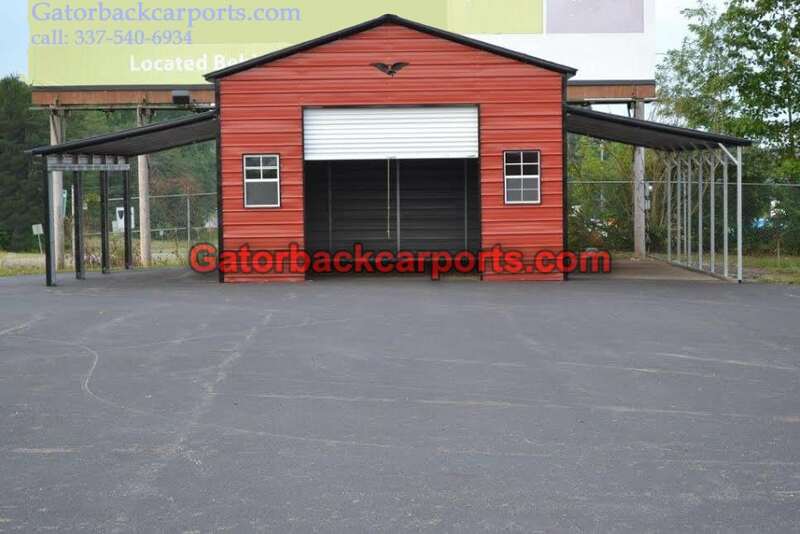 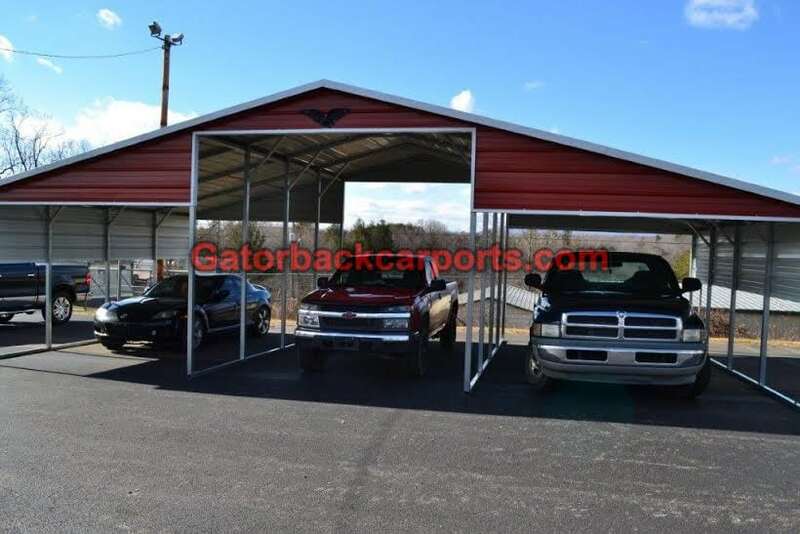 We guarantee the best prices on Lean To Carports, Lean To Garages, Lean To Barns, and Lean To Metal Buildings. 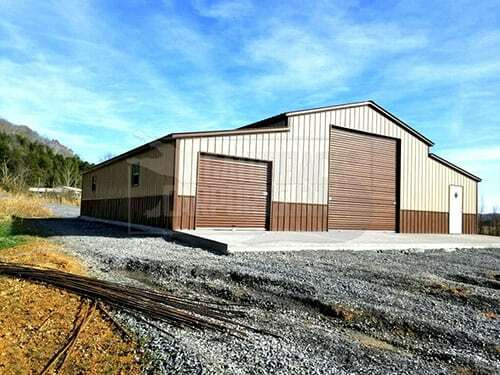 Our manufacturing facility prefabricates all our buildings, and this process reduces labor cost allowing us to transfer the saving directly to our customers. 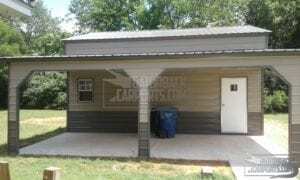 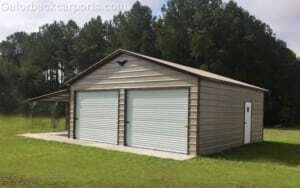 Metal garages with lean to’s are delivered for free in over 20 states including Alabama Arkansas Georgia Illinois Kentucky Louisiana Missouri Mississippi North Carolina Oklahoma South Carolina Tennessee Texas Virginia and West Virginia. Buildings with a metal lean to attached come in three different styles horizontal box eve, and vertical roof structures. 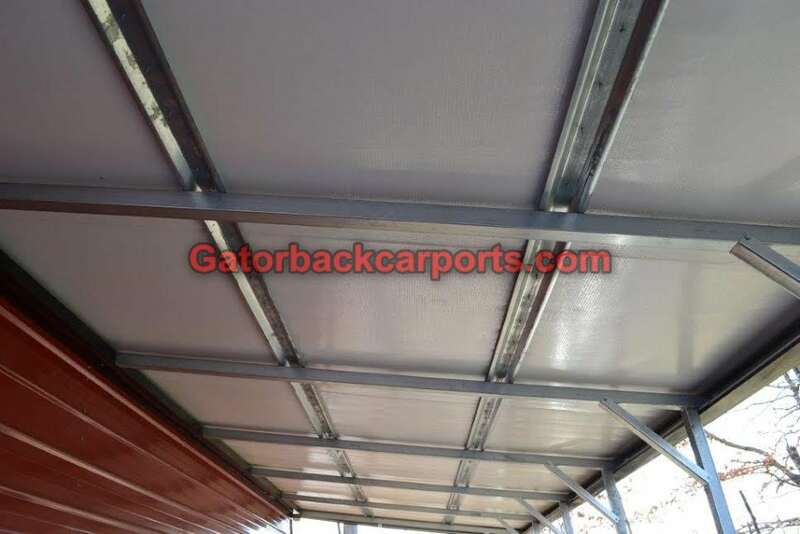 .There are many available options including open end lean to’s, enclosed ends, closed ends with cut outs and closed ends with installed garage doors. 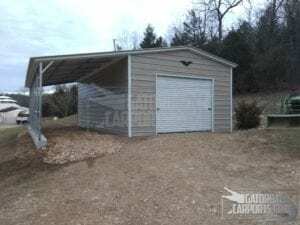 The lean to is normally 10 to 12 foot wide with the center building which it is attached to being normally 12 foot wide, 18 foot wide, 22 foot wide, or 24 foot wide. 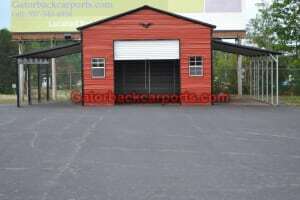 The available length are 21 foot 26 foot 31 foot 36 foot and 41 foot long. 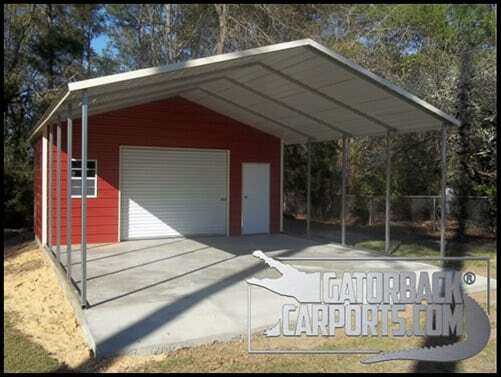 We can special build your lean even wider and with lengths greater than 41 foot. 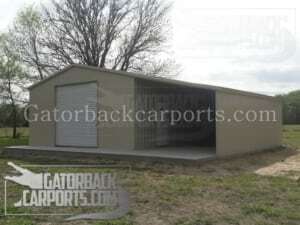 Pictured below Double Side Entry Garage with Front and rear Lean to’s. 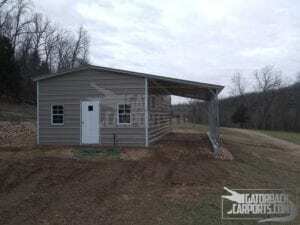 Lean to’s are trimed out with siding. 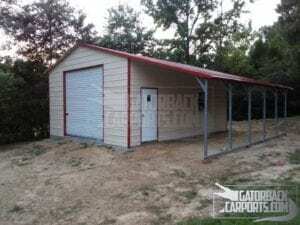 The advantages of owning a lean to building her numerous, for example a lean to building offers extra storage space and protection for your assets. Lean to carports protect, trucks, tractors, cars, boats, motorcycles, RV”s, farm equipment, and more. 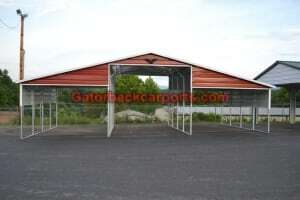 This is one of the most affordable shelters available. 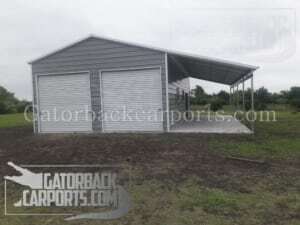 Another advantage of owning a lean to building with enclosed ends and garage doors is a deterrent from theft or vandalism. 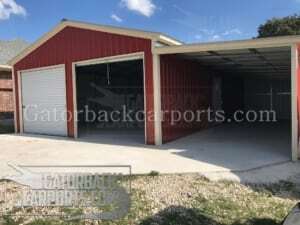 Many of our customers with specialty vehicles or classic cars often purchase a building with garage doors installed on both lean to’s connected to a center garage. 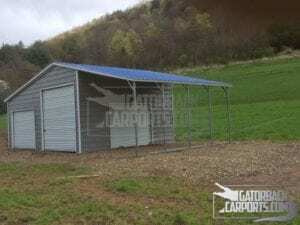 Livestock owners and horse owners also recognize the many advantages of a lean to connected to their barn and they often seek to keep their livestock in a facility that is not fully enclosed. 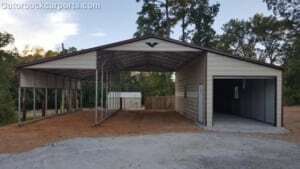 Horse owners often want to structure that allows their animals to exit and enter without the aid of human resources and this is a exact fit for lean to. 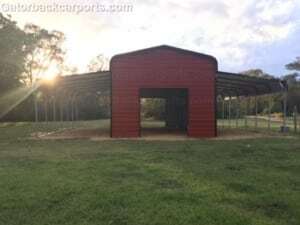 Also horse owners prefer structures that allow their animals to be kept in a field if it rains or snows the horses can go to the lane to for shelter. 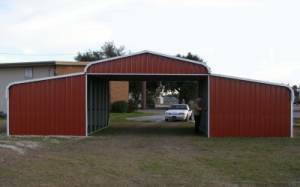 By purchasing a lean to a horse owner can provide shelter for his animals without building an elaborate structure that is costly. 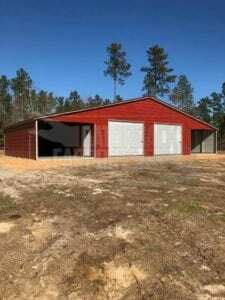 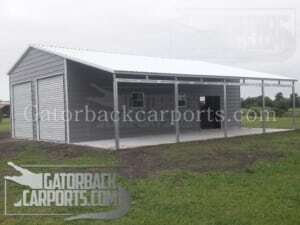 When our customers purchase a lean to barn, lean to garage, our lean to carport they are purchasing a quality product that comes standard with 14gauge are optional 12gauge 2 1/2 inch wide tubular galvanized framing structure. 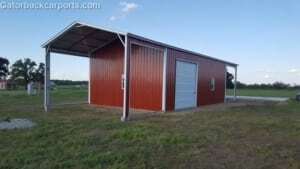 The sheet-metal is 29gauge. 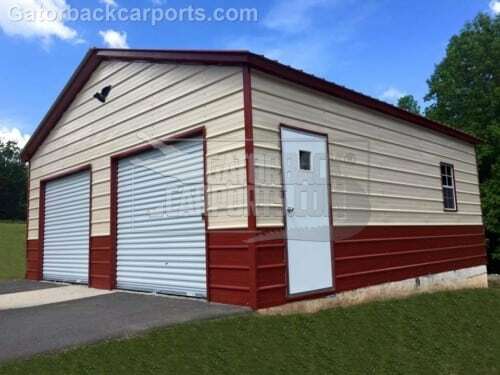 It comes standard with 110 mile-per-hour when ratings are optional hundred and 20 mile an hour when ratings and up to hundred and 40 mile an hour when ratings. 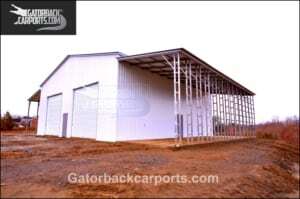 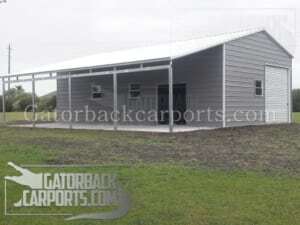 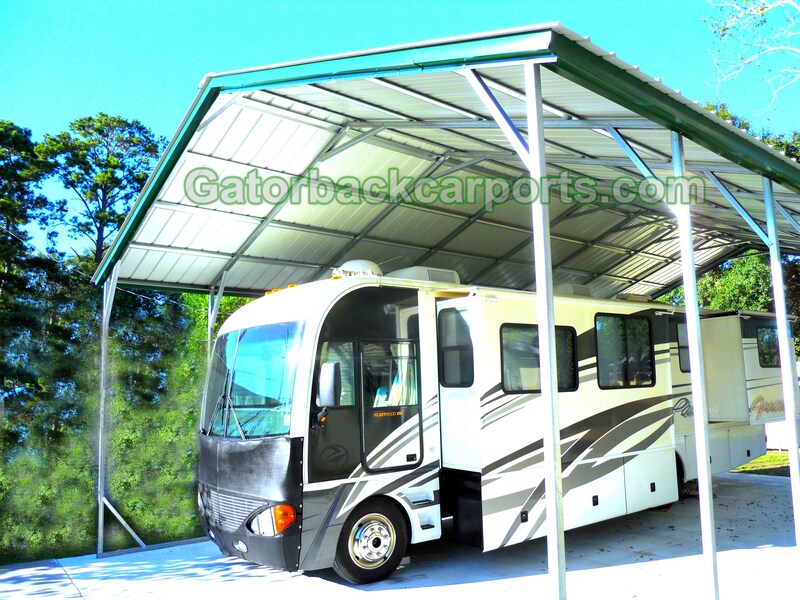 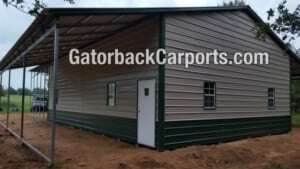 If you’re thinking about purchasing a building with a lean to we will be happy to help you you’re welcome to call one of the customer service representatives at gator back carports for assistance. 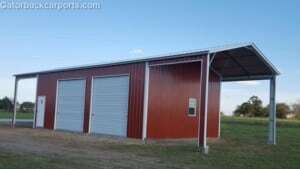 Here an example of two lean to barns and their pricing for the white barn with 3 garage doors pictured below. 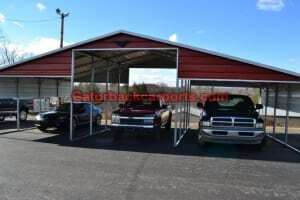 Please call us for additional prices, we sale over 100 different lean to products! 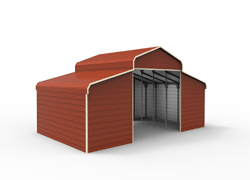 A barn is actual three buildings the center structure and the lean to attached on both sides. The red barn above has both ends of the lean to’s enclosed. 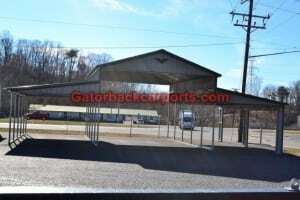 The white barn below has both ends and the center enclosed and a garage door on all the ends. 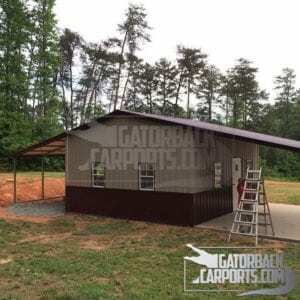 The price to enclose a end of a lean to that 10 to 12 foot wide and 7 foot tall side wall is $425, and for a 8 foot tall side wall is $475. 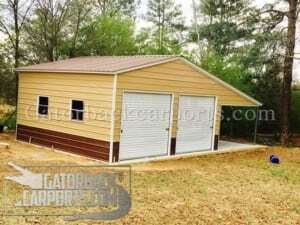 Please see our garage door pricing and sizes to determine those cost. 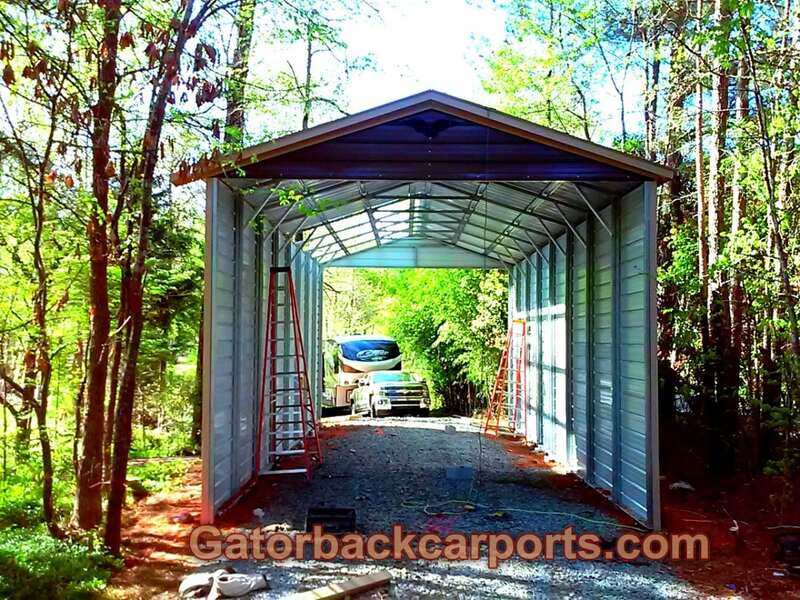 You can build and design your own Garage, Carport, or barn and the prices change automatically with our carport calculator just click on the Calculator at the home page.